The company became active in 1994. However the director of Matogard, Mart Ruumet, had earlier experience with soils as he had already held the position of Manager at Tori market garden which dealt with the making of soil for house plants. The production building of Matogard is on a large former Tori model sovkhos and was formerly a hay-barn.The enterprise now sells approximately 200 tonnes of fertilizer-soil per year. The main objectives of this project were to: - produce high quality bio-compost from horse dung and biodegraded clippings; - increase the quality of the planting soils and packaged compost. The production process became faster, economically more effective and more environmentally friendly as a result of the machinery purchased. 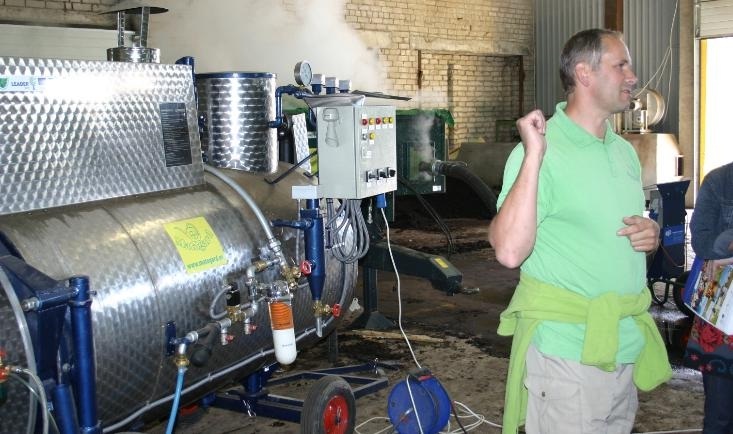 10 litres of naphta are saved with each 7 cubic metres of compost steamed. In addition to this as the scientific equipment purchased is modern and unique in Estonia techniques have improved with the work done in the testing lab. Healthy relationships can be formed between scientists and entrepreneurs. A win-win cooperation can be established whereby the entrepreneurs can do the majority of the procedures in the testing lab with the scientists only needing to provide quality assurance.